Statements from various high-ranking central bank officials prove they are totally clueless. For example, please consider an announcement today by European Central Bank (ECB) Vice President Vitor Constancio: Europe not at risk of full-blown deflation. During a debate in central Italy, Constancio said he did not think "that in Europe there is the risk of falling into full deflation" because nominal salaries would have to fall in all member countries "and this cannot happen". One really has to wonder about what is in these central bankers' heads. Constancio is wrong at least three ways. Even if nominal wages and salaries rise, consumers can choose to deleverage, paying down debt, rather than spend. It is not impossible for aggregate wages and salaries to drop in all or nearly all member countries, and indeed I expect just that when the European recession hits Germany. Advantage of inflation grossly misstated. 1. Can consumers choose to deleverage rather than spend? Sure, why not? Demographically speaking, Europe is in such bad shape, one might even expect just that. 2. Europe is clearly flirting with recession (see France Private Sector Output Drops 7th Consecutive Month, Orders Stagnate in Germany, Eurozone Flirts With Contraction). And in a European recession, one would normally expect aggregate wages and salaries to drop in all (or nearly all) member countries. Parts of Europe are already in deflation and recession. All it takes is Germany to join the party and it will be deflation across the board. 3. Inflation isn't all that it's cracked up to be. 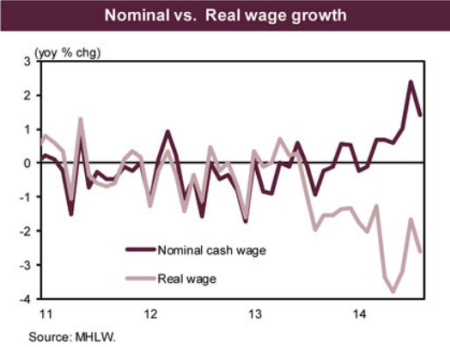 Consider Nominal Wages vs. Real Wages Japanese Style as depicted by Japan's Ministry of Health, Labour and Welfare. Is it possible for prices to rise more than wages? Certainly. Especially if the ECB gets it inane wish of trashing the euro to create inflation. Japan is out of deflation, but consumers are far worse off. All Japan has to show for its decades-long effort is debt approaching 250% of GDP. The statement by Constancio was so superficial and so wrong, in so many ways, one might wonder if it was purposeful misguidance or if he is really that much of a blockhead.